How can you give unemployed people with limited Estonian skills the encouragement they need? We are happy to announce that the international integration conference ‘Shared Identities in Diverse Communities: the Role of Culture, Media and Civil Society’ being held in Tallinn on 16 & 17 November will now feature a potentially fiery debate between politicians. The debate will start at 13:30 on the second day of the conference. All of the places at the conference have been filled, but the debate will be able to be followed live on the conference website at www.integrationconference.ee and in the Postimees portal at www.postimees.ee. The debate will be moderated by journalist Neeme Raud (photo Erik Prozes, Postimees) and Chair of the Supervisory Board of the Integration Foundation Kristina Kallas. The Club of Different Rooms (Erinevate Tubade Klubi) in Tallinn will play host to the very first Integration Hackathon on 24 & 25 November, at which teams of three to five people will start developing exciting new projects aimed at creating a more cohesive society. In cooperation with the British Council we are able to support participants from Ida-Viru County by offering them free accommodation and transport during the hackathon. On 26 November we celebrate Citizen’s Day. To mark the occasion, the Integration Foundation has put together a quiz – something it’s been doing every year for the past 15 years. - for everyone else interested from 26-30 November. Safe in the knowledge that what they need to know can be found online, people have gotten used to simply grabbing their phones and Googling things. But the questions in the Citizen’s Day quiz are put together so cleverly that a basic Google search won’t provide the answers. Find out what you’re capable of without Google as your lifeline. The people who put the questions together have done their darndest to make the quiz exciting. There’s so much to know about Estonian society that you learn something new every year. 15 years they’ve been putting together questions for the quiz, and not one of them has ever cropped up twice. Lots of the quiz questions are related to 2016. How much do you remember about last year? Once you find out one fascinating fact it inspires you to find out more about the same topic. This makes you more attentive generally and allows you to make connections between things using the knowledge you’ve gained. While people who never take any initiative complain of boredom, curious people lead exciting lives. Once you’ve had your fill of fun on St Catherine’s Day, park yourself in front of your computer and get quizzing! That’s a whole weekend right there. This February the Integration Foundation launched a pilot mentoring programme for unemployed people known by its Estonian acronym TEMP. 30 people are taking part in the programme: 15 pairs of mentors and mentees. - The mentees are unemployed residents of Tallinn and Ida-Viru County whose Estonian language skills are limited. The majority are aged 50+, although there are also some younger mentees. - The mentors are volunteers with the desire and the energy to help the mentees make positive changes in their lives. At the start of the project the mentors underwent two days of training. The programme provides the participants with the opportunity to communicate with people from outside of their ordinary circle of acquaintances through a variety of workshops, training events and get-togethers. For example, food preparation workshops have been held in Tallinn and Sillamäe; the Opinion Festival was attended in Paide; there has been a stress management course in Tallinn; and training on self-marketing is soon to be provided. On 30 October the mentees and mentors met in Tallinn with the personnel managers from a number of large companies (Ericsson Eesti AS, AS Vopak E.O.S., Omniva, ISS Eesti AS and Kaubamaja AS), who outlined their recruitment principles and shared useful job-seeking tips. The personnel managers underscored the fact that willingness to work carries much more weight during recruitment than Estonian language skills. The Integration Foundation’s Head of Cooperation Ljudmila Peussa says the meeting had a very encouraging effect on the mentees. “The personnel managers gave them loads of useful advice that will really help them in looking for work,” she said. TEMP is being carried out as part of the CROSS project ‘Cross-border cooperation on mentoring and peer support for immigrants’. The project is being supported from the resources of the INTERREG Central Baltic 2014-2020 programme financed by the European Regional Development Fund. TEMP hails from Finland, where it has been successfully implemented for many years. On 26 October the Republic of Estonia 100 and Countrymen Programme project competitions were announced, which support the activities of expat Estonian cultural associations with 100,000 euros to mark the anniversary year. According to Kristina Pirgop, Head of Partnership Relations at the Integration Foundation, the support given to foreign cultural associations is larger than before. “The year 2018 is special for the Republic of Estonia and we want events keeping Estonian culture alive abroad to turn into reality and Estonians living far away to feel like part of Estonian cultural life,” said Pirgop. According to Anne-Ly Reimaa, an adviser at the Ministry of Culture, the interest of expat Estonian cultural associations in the application rounds has been huge. “We consider it very important that Estonians living abroad keep a connection with their home country and that Estonian traditions and culture also be preserved at places where Estonians live. Estonians living abroad are often the first ones to introduce our country,” Reimaa said. According to Heilika Pikkov, International Programme Manager of the Estonian Presidency of the Council of the EU and Estonia's centenary, all Estonian friends from both sides of the border are welcome to celebrate the 100th anniversary of the Republic of Estonia. “This is the most important celebration of our country’s history – the time when all Estonians all over the world should feel like one big family,” Pikkov said. The Countrymen Programme competition projects are supported with up to 3000 euros, the Republic of Estonia 100 competition project with up to 7000 euros. The deadline for both applications is 30 November 2017. The project competitions are organised by the Integration Foundation and funded by the State Chancellery and the Ministry of Culture from the resources of the ‘Countrymen Programme 2014–2020’. The Countrymen Programme is managed by the Ministry of Education and Research. More information about the anniversary programme can be found online at www.ev100.ee. This winter will see Estonian language and culture clubs organising activities all over Estonia: 14 clubs will be starting in Tallinn, 12 in Ida-Viru County (two in Sillamäe, six in Narva, two in Jõhvi, one in Kohtla-Järve, one in Ahtme) and two in Tartu. Who are the clubs meant for? who want to overcome the language barrier, need support and encouragement to use Estonian more confidently in everyday life. * Potential club members are sent personal invitations. * Friends and acquaintances of club members can also join the club, if they have completed the national B2 or C1 level exam. Each club has two group leaders and 16 members from different private and professional backgrounds. The club meets once a week for six months altogether. During this time there are six excursions to different museums, concerts, the theatre or sports events as well as naturally beautiful parts of Estonia. The clubs were established in 2015 and 760 members have participated during these two years. The club will continue to operate until 2020. 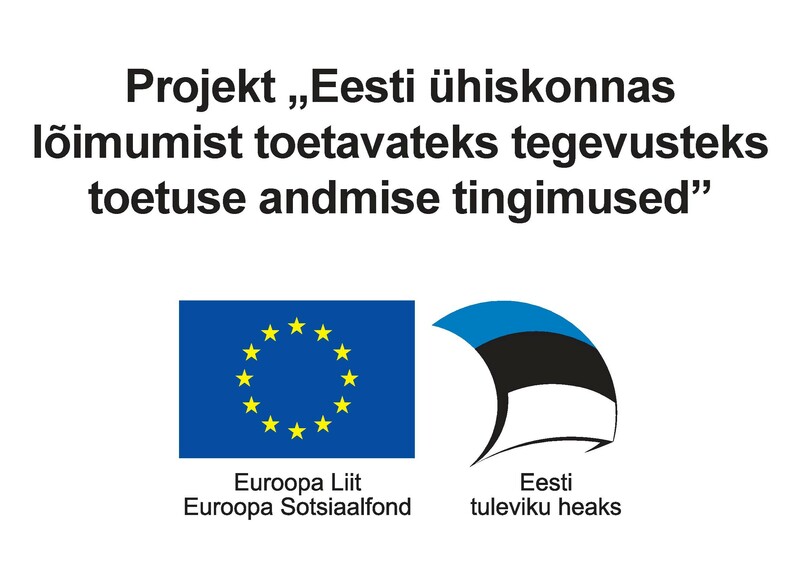 The clubs’ activities are financed by the European Social Fund as part of the activity 5.2.2 of the project ‘Activities supporting integration in Estonian society’. Club meetings are organised by the Integration Foundation in cooperation with Change Partners OÜ, OÜ Keelepisik, ImmiSchool – Uusimmigrantide Koolituskeskus OÜ and Atlasnet MTÜ. A simple and practical guideline has been prepared for applying for Estonian citizenship. There are two versions of the printed materials: Estonian-English and Estonian-Russian. Information about these six steps is available here. In addition to the round of applications that was held in summer, which saw 24 national minority Sunday schools granted state support, the autumn round saw a further six Sunday schools receive funding. Kristina Pirgop, the Head of Partnership Relations with the Integration Foundation, says that the 23,100 euros granted to the six Sunday schools will cover Ukrainian language and culture studies in Maardu, Ingrian culture and Finnish language studies in Pärnu, Korean and Georgian language and culture studies in Tallinn and Russian language and culture studies in Pärnu this academic year. A total of 520 students are enrolled in the Sunday schools being financed in 2017, which employ 70 teachers. The activities of national minority Sunday schools are funded by the Ministry of Education and Research. 100 Narva taxi drivers will be commencing 120 hours of elementary Estonian studies in November funded by the state. Jana Tondi, the head of language and cultural immersion with the Integration Foundation, says the courses are able to go ahead thanks to the government approving a Ministry of Culture application for further funding for free Estonian language studies in 2017 and 2018. A list of taxi drivers interested in the courses was submitted to the Integration Foundation by Narva City Government. The courses are being run by the Edukool Foundation in seven groups from November this year through to the end of November next year. Each course will end with an exam. The Ida-Viru County Integration Centre has launched a project in order to give young people between the ages of 13 and 18 with different mother tongues the chance to work together, make new friends and find out about Estonian history. Students from schools in Kiviõli, Jõhvi, Sillamäe, Narva and other parts of Ida-Viru County with Eesti and Russian as their languages of instruction are being integrated as part of excursions to the Estonian National Museum. On the way there they also stop off at Iisaku Parish Museum and Mustvee Old Believers Museum. The groups comprise students from different schools so as to ensure a good mix of students with both Estonian and Russian as their mother tongue. 40 students from four schools in the Narva area (Soldino Gymnasium, Paju Secondary School, Narva-Jõesuu School and Narva Old Town State School) took part in the first excursion on 11 October. The project is being supported by the Integration Foundation. 40 youngsters from upper secondary schools in Narva, Sillamäe and Kohtla-Järve visited Rakvere on 30 October as part of a programme designed specifically for people aged 17-19 living in Estonia that aims to foster contact between them and show them what they can make of themselves in the country. During the event they met with the head of the Commission on the Stability of Cyberspace and former Minister of Foreign Affairs Marina Kaljurand, Defence League Viru district instructor and senior operational officer Erik Sild, Virumaa Teataja newspaper editor Anu Viita-Neuhaus and Rakvere mayor Mihkel Juhkami. The speakers talked about their career choices and the recommendations they would give young people. Alongside these heartfelt stories and valuable advice, the Tarvanpää Society (www.tarvanpää.ee) also performed folk dances. During the second half of the day, the team behind the Tolerant School project organised a school bullying forum-style theatre designed to prevent bullying and highlight the seriousness of the issue. At the end of the day the attendees were able to try their hand at being journalists when Anu Viita-Neuhaus from Virumaa Teataja gave them a practical task to complete. The Integration Foundation’s Head of Cooperation Ljudmila Peussa says that students from local schools are always invited to take part in these excursions as well – this time from Kadrina High School. The Russian Culture Sunday School in Tallinn is inviting everyone to their open day starting at 16:30 on 14 November in the lecture hall of the Neitsitorn café and museum. The theme of the event is ‘Russian cuisine from the late 19th and early 20th centuries’. Visitors will find out about the most famous cafés and restaurants in Tallinn and St Petersburg from that period, while the organisers will be talking about the history of popular dishes and giving people the chance to try them for themselves. The menu will include cold starters, a soup and a dessert served with tea. The event is taking place with the support of the Integration Foundation and in association with Tallinn City Museum. Admission is on the basis of advance registration. The number of places is limited. T he Iris show group are inviting everyone along to Lindakivi Cultural Centre at 16:00 on 2 December to help them celebrate their 20th anniversary. They will be performing alongside the ensemble Zlatõje Gorõ, actor and singer Eduard Toman, soloists from the Aplaus Creative Centre and singer Rafael. Iris was formed in 1997 from students of the Aplaus Creative Centre’s variety studio. Its original line-up included Artjom Solovjov, Natalja Tšernobajeva, Marina Taruta, Ludmilla Katskova and Olga Tšopenko (who was replaced by Nadežda Karpenko in 2001). Its repertoire includes stylised folk songs, variety songs, jazz compositions in 10 languages and songs by Estonia’s own Raimond Valgre. The show group have won numerous awards at international variety song contests in Russia, Belarus, Latvia, Lithuania, Estonia and Armenia.